The editors of the New Karl Scheit Guitar Edition, guitarists all, have unearthed a rare gem in Marella's Sonata. Having made his mark as an accomplished violinist in the 18th century scene of Paris and Dublin, Marella relocated to London to continue his career, becoming also a teacher of guitar and composer of study volumes for that instrument. 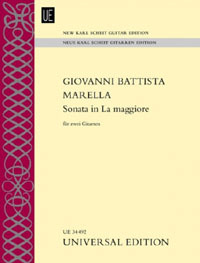 The Sonata in La Maggiore is taken from a second volume of pieces dating from 1762, and consists of three movements - Andantino, Largo, and Menuetto a theme and five variations).